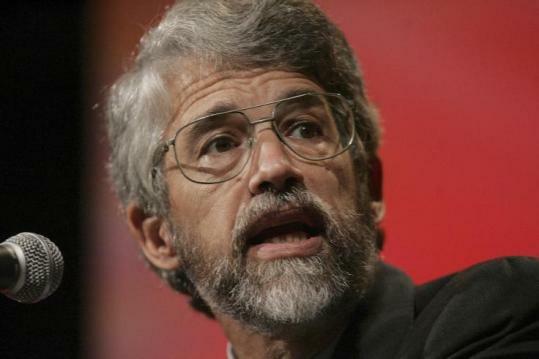 In Cambridge classrooms, at the United Nations, and on the "Late Show with David Letterman," Harvard physicist John P. Holdren holds forth on global warming, delivering a deluge of scientific facts to underscore his warnings. Now, he'll have the ear of the president, too. President-elect Barack Obama used his weekly radio address yesterday to formally announce that Holdren will be his top science adviser, serving as assistant to the president and director of the White House Office of Science and Technology Policy. Holdren "has been one of the most passionate and persistent voices of our time about the growing threat of climate change," Obama said. "I look forward to his wise counsel in the years ahead." Obama be warned. Holdren speaks his mind. Former Harvard student Jason Meyer recalled the aftermath of hearing Holdren lecture on climate change. "By the end of it, you wanted to buy a bunch of canned goods and a shotgun and go live in a compound somewhere," Meyer said. "Holdren doesn't cut any corners or paint any pretty pictures." Holdren - known to his colleagues for the breadth of his intelligence and expertise, his ability to build consensus, and his good judgment - has openly criticized the Bush administration for manipulation and distortion of science. His willingness to take strong positions on controversial topics, and his active role in crafting policies, isn't what the public traditionally thinks of as a scientist. "Those of us who watch him work also watch how he listens," said Ralph Cicerone, president of the National Academy of Sciences. "He's a little different because he's been outspoken, but I think people have always found him rational, reasonable, and well-versed." Holdren sees science through a prism that fits well with Obama's larger goals, said Calestous Juma, a Harvard Kennedy School professor who began working with Holdren on sustainable technology and development issues in the early 1990s. He has been a leader in "exploring how science and technology could be used for promoting cooperation among nations, as a way of enhancing diplomatic relations between the United States and developing countries." Holdren, 64, said in an interview yesterday that the appointment is "the biggest honor and most important thing that I've ever been asked to do." He said he first met Obama when he sat next to him at a dinner with other climate change experts 2 1/2 years ago. That experience and other interactions, convinced Holdren that the president-elect had a deep respect for science, and an interest in elevating it to new prominence so it would not be suppressed or ignored. "I would never expect that what the scientist might prefer is always going to be the outcome," Holdren said. "But I can tell you, with great assurance, that no one will be ignoring the facts." Born in Sewickley, Penn., Holdren grew up in San Mateo, Calif., and studied aerospace engineering and plasma physics at MIT and Stanford University. Former classmates said he was known for his stellar grades, his friendly demeanor, and his leadership skills on everything from a how-to-get-people-to Mars class project to a less grandiose venture involving mixing martinis. The cocktail venture came during his hazing for an MIT fraternity. He and classmate J. Craig Wheeler were awakened in the middle of the night, led to a room, and told to build a machine from scratch that could mix and pour a cocktail, Wheeler recalls. Holdren played a key role in overseeing construction of the Rube Goldberg-like machine that succeeded in meeting that goal, Wheeler said. "John was already kind of expressing his leadership ability," Wheeler said. "He was a special character, even then." Since then, Holdren's resume has spanned a dizzying array of accomplishments. For more than a decade, he chaired the Committee on International Security and Arms Control at the National Academy of Sciences. He served on a scientific advisory panel for President Clinton. He is cochair of the bipartisan National Commission on Energy Policy. He is a professor of environmental policy and director of the Program on Science, Technology, and Public Policy at the Harvard Kennedy School. Holdren also directs the Falmouth ecological research hub, Woods Hole Research Center. His importance never made him unapproachable, former students said, but he often had a suitcase ready in the classroom - poised for a last-minute dash to a meeting in Washington, D.C. Colleagues, students, and friends expressed deep admiration for Holdren, who lives with his wife, biologist Cheryl E. Holdren, in Falmouth. They have two children and five grandchildren. Perhaps the best way to understand Holdren's work ethic and attention to detail, they said, is by looking at his hobbies - from his annual tradition of e-mailing friends an exhaustive analysis of wine ratings, to his love of fishing. "After fishing at the Cape, he will go home and enter into a spreadsheet . . . the time, the wind, the light, the water, the fish we caught - where, how," said Graham Allison, a friend and director of the Belfer Center for Science and International Affairs at the Kennedy School. Carolyn Y. Johnson can be reached at cjohnson@globe.com. Bina Venkataraman can be reached at bina@globe.com.